In the US, SpaceX re-landed  first-stage boosters of its second-hand Falcon 9 rockets, and re-used  spacecraft on a supply mission to the International Space Station. In New Zealand, start-up Rocket Labs launched  a rocket mostly made of 3D printed parts. With significant government-led investment in the space industry in Asia, particularly in China  and India  (alongside some big ambitions ), one would conclude that the future of space lies with these rising powers, both of which have been accelerating their space programs. But the numbers show otherwise (Figure 1). Data from Space Launch Report . This year, SpaceX alone will perform more launches than any other nation—more than the US, China, Russia or Europe. 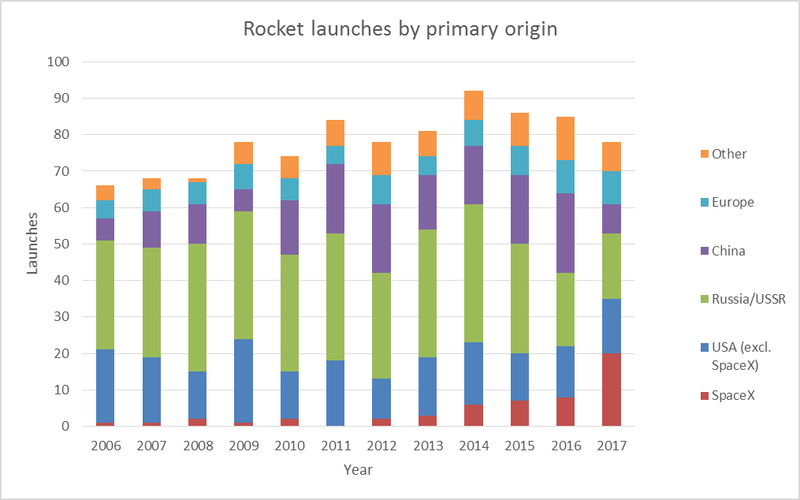 This disruption by SpaceX isn’t just because of aggressive cost reductions; reusable rockets and spacecraft can significantly expand  market potential by negating long production lead times, which have hampered the industry in the past. Yet, while the US remains the world’s leader in new launch technologies, competition in coming decades is inevitable  and already  on the horizon. In the short term, private citizens and taxpayers in Australia are going to reap the benefits of new technology and competition in launches, which will lower the cost of space access. With the US as the pioneer and early benefactor of a larger space market (and therefore greater space capability), Australia is likely to continue to enjoy the security of American space dominance. But, in the long term, an order of magnitude reduction in launch costs will have significant implications for us. Last week, Flavia Nardini, the CEO of Australian start-up Fleet Space, wrote an open letter  to the Australian Government imploring it to establish a space agency. Space capability is no longer just an expensive status symbol showing off the industrial and technological prowess of a nation—it provides tangible economic value. Yet, Australia’s space industry is only in its infancy, employing  11,000 workers and contributing around $4 billion a year to the economy. Australia will find it difficult, if not impossible, to compete on the scale of private enterprises such as SpaceX and Arianespace, or rising powers like China. But, on the other end of the spectrum, there are opportunities for us to excel in support capabilities: microsatellite launches, advanced solar technology , mission support , test ranges  and ground stations . Establishing a space agency doesn’t necessitate investment in a sovereign launch capability; space agencies deliver value by providing a central point for academia, industry, defence and foreign entities to collaborate among themselves and with government and to facilitate the flow of knowledge and capital. While the economic arguments for an Australian space agency are sound, there are also significant geostrategic reasons. Earlier this year, the Center for Strategic and International Studies released a report  on the implications of ultra-low-cost access to space. With lower launch costs, space-based weapons and counter-weapons systems on a mass scale become increasingly feasible, as does rapid international transport. Commercialisation of the space industry will also challenge controls to limit the proliferation of missile and space technologies. Because procurement cycles extend into decades for sophisticated technologies, decisions about exploiting the benefits of such systems (or avoiding the risks) are not far off. To meet these challenges, Australia will need to domestically develop, sustain and leverage expertise in the space sector. Therefore, space policy can’t simply fall under the umbrella of the Department of Defence; a whole-of-government approach will be required. With the internet and telecommunications, the Australian civilian and defence communities have taken for granted instant, high-fidelity communication, but our communication channels with our allies aren’t as reliable as they seem. Our connections  with the rest of the world are concentrated in fibre channels to three cities, easily severable  by the 250 + submarines that will be operating in the Asia–Pacific by 2030. In that scenario, the only remaining communication capabilities left for Australia, aside from short-wave radio, are satellite systems, which Australia currently has no capability to launch. Without a space agency, Australia will simply never have a coherent, unified strategy to achieve defined goals and capabilities in space. The option of a space agency isn’t about making a decision—it’s about giving decision-makers options. Haimin Huang is an Alliance 21 research intern at the United States Studies Centre at the University of Sydney. The author thanks Brendan Thomas-Noone for his guidance.